The new phosphate-free SOMAT offers the best cleaning performance. At the same time it is environmentally friendly. It is enriched with the strength of citric acid and helps to remove even hard-to-wear dirt without any effort. 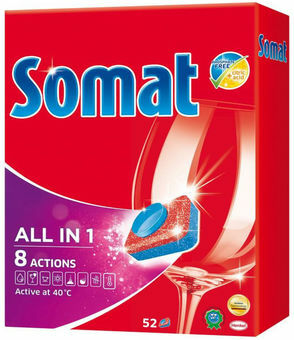 Somat 8 All in 1 offers, besides the usual functions such as rinse aid and salt, a new function of neutralizing the odor and acting at 40°C.